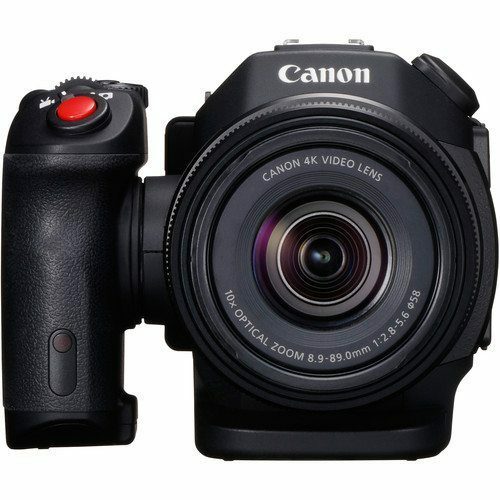 Canon XC15 Compact and lightweight with a 12-megapixel, 1.0 inch-type CMOS sensor, this digital video camcorder is capable of recording in the broadcasting industry’s standard 4K UHD (3840 x 2160) format. 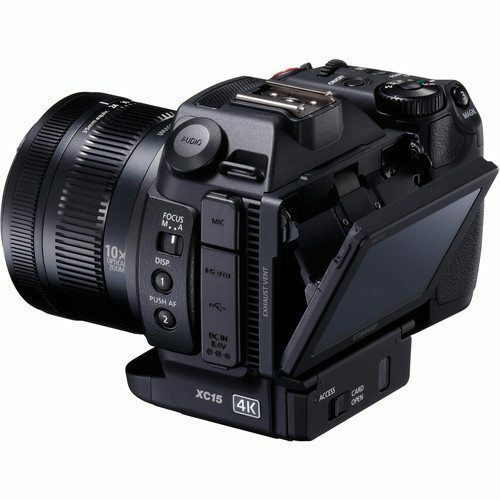 Equipped with the DIGIC DV5 image processor, it enables low noise shooting even at ISO speeds as high as ISO 20000. Featuring the Microphone Adapter MA-400 which support XLR connection, it achieves balanced audio inputs and impeccable sound quality sought by professionals. 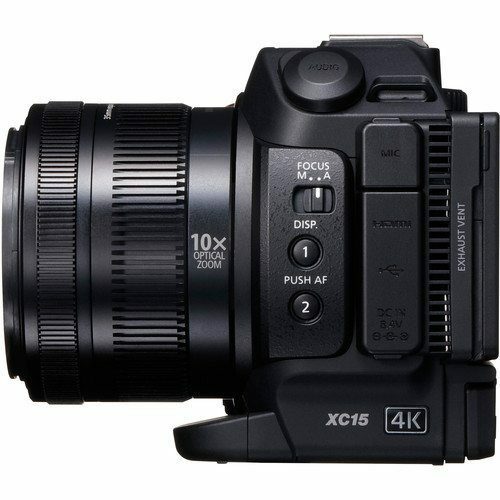 The 10x optical zoom lens covers a focal length range of 27.3mm to 273mm (35mm equivalent for video recording), and is armed with a powerful optical image stabilization system that is very proficient in correcting camera shake – a strong source of support for videographers, journalists and other professional video producers. Its ability to record at 24fps in both 4K UHD and Full HD also makes it ideal for use as a sub-camera in cinema productions. 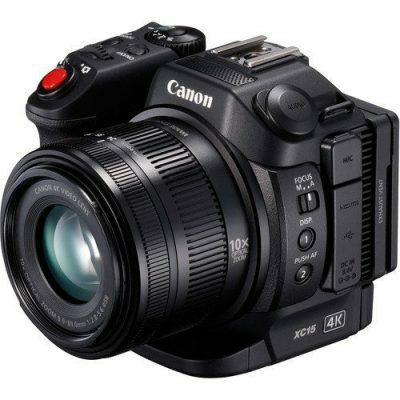 Microphone Adapter MA-400 is included with Canon XC15, and has two XLR input terminals that allow attachment to XLR-compatible external microphones. This results in high quality audio recordings, with no recording noise where different input source settings such as volume can be differentiate for each terminal (CH1/CH2). 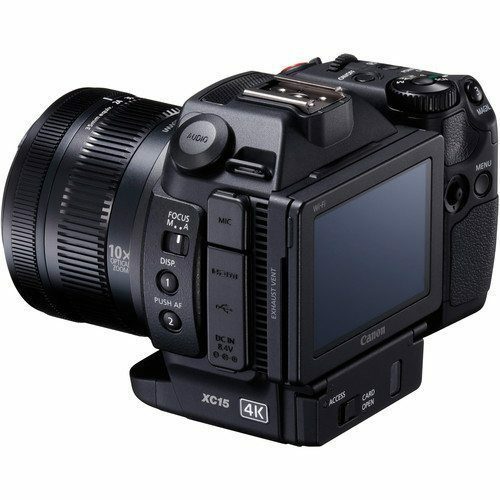 The 3.0 inch, 1.03 million-dot LCD monitor supports the display of a waveform monitor on its exposure setting screen, making it possible to check the status of input signals even in light conditions that make the display difficult to see, such as during outdoor shoots. This makes it extremely handy on the set, especially when synchronizing the exposure settings with the footage on the main camera. The Canon XC15 features the Canon Log mode, which has proven to be effective on cinema production sets and which makes easier to carry out detailed adjustments for highlights and shadows in post. There is also the Wide DR (Wide Dynamic Range) mode, which boasts a dynamic range almost as broad as that of Canon Log, effectively prevents blowouts and black crush, and achieves natural-looking gradations. Besides these settings, the movie gamma “Look” modes from the EOS C300 Mark II have also been newly added, enabling more efficient post-production in instances where the Canon XC15 is used as a sub-camera. Also available in-camera, Highlight Priority mode helps prevent the loss of detail in high-brightness areas by reducing the mid to high-brightness compression levels of the standard gamma mode – thereby achieving an effect similar to HDR.